The first week of July provided the greatest market gains in over a year. Weeks like this require us to step back and review exactly what all the euphoria was about! To ensure we have our feet firmly on the ground, I've highlighted a few items here. Rails continue their march higher in terms of total rail traffic. We are actually nearing (not there yet) levels late 2008. Each sub-category continues to see year-over-year improvement. Of all the individual rail carriers, CNI (Canadian National Railroad) is seeing the most significant recovery compared to levels from 2 years ago and they are actually very close to matching those tonnage rates. When I see fundamental data like this, I like to check in on the stock price of the company to see if it has priced in the good news. As we examine this 5 Yr chart of CNI, we actually see that we are trading ABOVE levels we've seen in 2008 and prior. While CNI did drop significantly since April, it generally held support at $57. Despite this good news, I am not sure I'd take a flyer on a long position in this rail and I'd wait for the $57 level to be taken out for a short trade. Moody's is showing that in April their property price index showed a move up of 1.7% in commercial real estate prices. With this week's amazing rally we see a significant rebound in the Bloomberg Financial Conditions Index. Recall that a level below 0 indicates we are in a contraction (read recession) and a level above indicates an expansion. We had a few months on the edge of recovery, but then stalled and collapsed. We will need a sustained capital market recovery to signal much better than we've experienced in the last several months. The Weekly Leading Indicator data released by ECRI last Thursday again showed slowing in the economy. While the dip in the number is concerning, what we are really examining here is the rate of change of the growth or decline. Right now, the growth model is showing a level of -8.3% in their indicators and this is essentially the 5th straight negative reading. As I've mentioned before, this study released on the public ECRI site includes the stock markets in their model. The decline in the model therefore is highly correlated to the significant drop we've seen in markets over the last 7 or 8 weeks. We might see a rebound or leveling off of this number because the first week of July was so strong in equity markets. Of course, the rebound may be tempered by the poor showing in housing. Housing has done an excellent job of feigning recovery. Of course the false recovery has been based primarily on the largess of the US taxpayer courtesy of the $8,000 and $6,500 stimulus. The only problem is that we are slowing in sales as a result of the removal of the generosity! 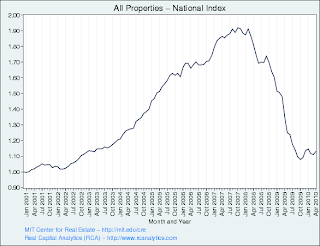 The graph from ECRI shows this, but the chart from NAR (click on the link -1st table) clearly shows the inventory build and decline in sales from the peak. In my mind it is even more concerning to look at the second table. This is a graphic of housing prices. In May (last month of the stimulus) we see that the average house price deal shot up hmmmmm let's see about $7,000 from the previous month in April!!!!! Is that truly amazing? We have a stimulus plan in place that gives buyers about $7,000 in credits so they go out and spend about $7,000! For me I would hope that the buyer would negotiate better and would essentially get some benefit for our money, but no, the buyer simply paid up more than the previous month and gave the money away! And that is really my point here, when it is someone else's money, you are much more apt to piss it away rather than spend it in a frugal and wise manner. Katrina debit card's anyone? The June release of the April data shows that we are still feeding 40 million Americans at a cost of greater than $5 Billion a year. Let the 40 million number sink in, that is 13% of our population! Until we see real job creation (not census workers) this will continue to rise. I have mentioned it before as well, the cessation of fishing and the clobbering of tourism in the Gulf States will only add to this. Note, this is April's data - before the impact of the oil spill with the Deepwater Horizon. Credit markets continue to show stress, but less so than a couple of weeks ago. 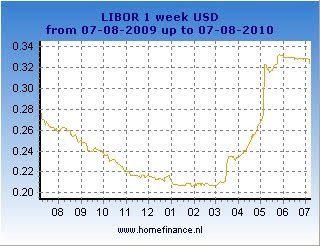 Libor continues to remain elevated (in this context) and we see that treasuries are still very low in a historical sense. 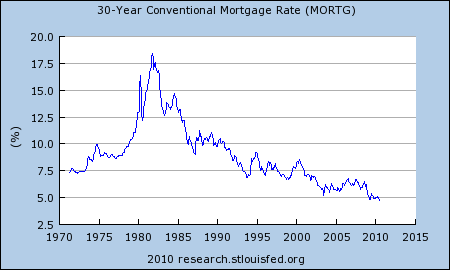 I noticed that mortgage bonds are really low where you can obtain 30 year financing for 4.5% with decent credit. I still am anticipating that we will see long term mortgage rates at 3% or 3.5% as our government does anything they can to get the economy going (hello Japan!). How do we get to that 3%? - I am fully anticipating the Son of Stimulus to arise soon in the form of another housing recovery stimulus and also an overt devaluation of the dollar by the Fed and Treasury. Any wonder we keep hearing about China and their currency manipulations again? I wrote more about the Son of Stimulus in my 2nd Quarter Wrap Up . I made a post about a week ago about the break out in TLT where it popped above $100.15 which was a significant sign of stress. As usual as soon as I post something that I've been watching it completely reversed, but the point in the posting is that we must watch these warning signals because they are showing up and I believe they are going to usher in the Big Kahuna drop at some point. As we'll see later on in the post more and more alarms are going off and we need to remain vigilant despite the great feelings we have from last week. One of those alarm bells we need to look at is the Coppock Turn Indicator. This is simply a 14 month moving average on the Dow. When the 14 month moving average changes direction, it is a warning that a fundamental shift has occurred. Now for most traders and Slopers this 14 month indicator is way too slow, but it is useful to see that it did turn in June due to the close below 10,000 and this signals that the market should continue to go down. Just to give you a level to look for - the indicator would turn positive if the Dow closed July at 10,650 or above. What do you know, the markets rallied and the USD got clobbered. This is one of the only policy tools left that the Fed and Treasury have. If they have any mojo left at all, Uncle Ben and Turbo Tax Timmy will be attempting to rally markets, inflate assets, and devalue bucky to restore confidence. The Baltic Dry Goods Index is in a free fall. It has decline more than 30 days in a row I believe. It is suddenly much cheaper to ship all of those raw materials to China or wherever. Personally I have not been able to discern the cause except for the interpretation that China is done stockpiling commodities or there has been commissioning of an entire armada of freighters that can now carry dry bulk for the world. (I'm leaning toward the first one). Again, I know this is the spot price for shipping, but the chart says it all. Again, I wouldn't be buying DRYS here based on this pricing and certainly not on their leverage on balance sheet. Shipping companies have also been performing poorly because their are thoughts that firms will need to do equity issuance to help them raise cash. Overall, last weeks performance by the bulls was very strong. If there was ever a time for a comeback that was it. Pessimism was so thick you could cut it and I believe that bears got a little too brave (I did). Many longer term charts are illustrating that there has been a shift to the bearish camp. These include the Coppock indicator mentioned above, the 13/34 EMA crossover ,and the TLT breakout,. All of these items make we want to get really bearish and put down serious long term cash on the short side. I have not put this to work yet simply because I know that the government is increasingly boxed in and are in a position where they must react. A perceived policy failure on their part would be devastating and there for I expect massive stimulus. This level of stimulus would certainly blow up a short trade quickly (remember the financials short ban?). We are also entering the thick of summer and earnings season. I believe results will be pretty good, but guidance should be timid and weak. As I build my own strategy I am pretty content to trade small and wait things out till earnings wind down so I can begin to scale into larger long term short positions.